I can remember being at a conference or somewhere that my dad was speaking and during the worship music that the band was playing people were lifting their hands, swaying back and forth and closing their eyes…it was bizarre! Yet, at the same time I felt the urge to lift my hands just to see what it felt like. I wouldn’t dare! I was not raised in a church where people did this sort of thing. Why would they?! We were dignified, singing only hymns from a hymnal led by a choir dressed in polyester robes to their ankles with big satin collars, accompanied by an organist. No sir! We were not led into worship with the most high God by some hoodlum, wearing ripped jeans with holes in his ears and tattoo’s down his arms, who claimed to be saved. At least that’s not what I was taught. This was before I took hold of the truth that things we are taught growing up are not always for our betterment. Some beliefs stem from insecurities passed down from generations, prejudices, years of attempting to follow rules instead of pursue a relationship. They are fine for remaining stagnant and unaware that there is anyone in this world who might have it worse than I. So why leave the bubble of neutrality and meaningless messages from a communicator who stands high in a pulpit, adorned in black robes, speaking hollow words that are difficult to understand and will soon be forgotten even if they did contain depth. One who is incapable of reaching people because of his lack of ability to relate to those of us who have done things that he would deem unforgivable. There is a song by Josh Wilson called I Refuse. The lyrics speak to this very thing. I remember the first time I lifted my hands as high as they could go towards the Heavens. It was not even 3 years ago. I was in the shower and as the water hit my face and I could feel the muscles in my arms stretching and my spine straightening, I closed my eyes. I felt a oneness and also a homesickness of sorts…all at the same time. It was just God and me. It felt as if there was no barrier. Not even clothes! I had never felt such closeness with the Father. It would be some time before I raised my hands to the Heavens in public. It was just too far out of my comfort zone. Or shall I say it ventured too far outside the realm of my ego. My pride (one of many words derived from ego) would not allow me to open my palms or lift my hands to the maker of heaven and earth. For years I sat in an uncomfortable state when I heard a song that spoke my story. The story I was living at that moment. It was as if gravity itself were keeping me from lifting my hands. 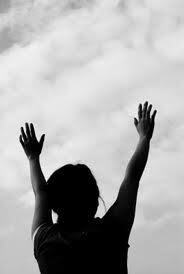 There was a time when I felt that I was denying God by not opening my hands when I felt moved to do so. I would learn later that the reason my ego kept me imprisoned was because the day I lifted my hands to the sky while singing a worship song, I felt a freedom that I had never known. Complete surrender. For once in my life, I didn’t care what people around me were thinking. And the truth is, they probably weren’t! 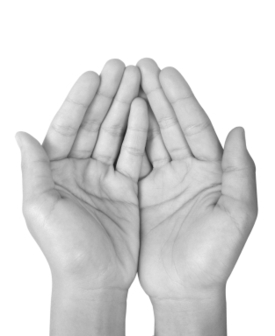 I opened my palms and spread my fingers as wide as they could go, while being led into worship by someone wearing jeans with holes in his ears and tattoos down his arms. And I promise you this, God poured out blessings in the form of a better understanding of circumstances, removal of fear, empathy for the lost, love for those hurting, I could go on and on…I closed my eyes and lifted my head to the giver of life. Though I was in a building with a roof, it felt like gold dust was raining down onto my face, filling up my hands and spilling over. No longer would I look down in shame. This song by Tenth Avenue North – You are More says it better than I ever could. My challenge for you… go to a quiet place, close your eyes and open your hands. Be still… for even 30 seconds. God will meet you there. This entry was posted in Uncategorized and tagged Faith by Joy. Bookmark the permalink. Thank you for your comment. It truly is a daily thing for me. I have to physically, not just mentally have outstretched palms in order to let go of the reins. Sometimes it's a moment by moment choice. I really enjoyed this post. I'm one of those people who always struggles to keep control, closed fist, and everyday its a fight to open my hands and relinquish control to the one who wants nothing but to prosper me.